And histamines are a component of the stomach acid that helps break down food in your stomach; this is why foods can cause histamine reactions, not just animals, pollens, fragrances, etc. This is where it gets interesting if you’re a geek like me. 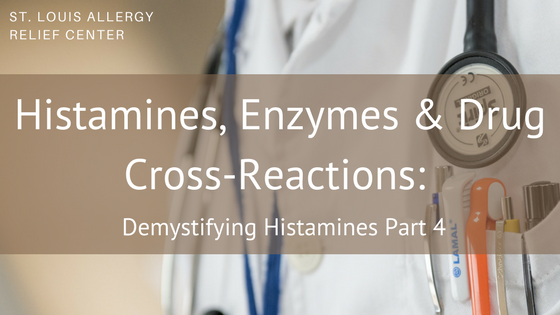 Guess what can also trigger a problem with your diamine oxidase and histamine n-methyltransferase levels? Gluten, alcohol, energy drinks, tea, yeast, gastrointestinal inflammation, ibuprofen, aspirin, anti-depressants, immune modulators (Humira, Enbrel), antihistamines (of course), and acid-reducers (Pepcid, Tums, Prilosec, Nexium, etc.). Any of those sound familiar from my previous post? What can they do other than prescription drugs that eventually stop working or create new and similar symptoms? Isn’t it time to start feeling better and get a handle on the way you react to the histamine levels in your food, environment, and body? Contact St. Louis Allergy Relief Centers to get started on your treatment today!